Social Fixer, you may recall from my previous glowing review, eliminates many Facebook annoyances that arose from bad programming or deliberate abuse of users. For instance, Social Fixer makes the Enter key insert a line break instead of ending and submitting a post. It also lets users control what they see on their Facebook pages, instead of what Mark Zuckerberg wants them to see. It’s estimated that between 500,000 and 1 million people use Social Fixer. After struggling vainly for several months, Kruse gave up on fixing the original Social Fixer. The new version 15 is a complete rewrite. It’s faster, simpler to use, easier for Kruse to maintain, and incorporates new features that I didn’t realize I desperately wanted until I saw them. One of my favorite features is the ability to mark an item as read, so the next time you view your feed, you see only the new content. Kind of like email, right? You don't want to keep seeing the same items over and over. I also love that Social Fixer lets you stay in "Most Recent" mode, instead of constantly switching you to the "Top Stories" view. Social Fixer’s Wrench icon has a “Hide/Show Parts of the Page” option on its dropdown menu. This feature highlights with a green box the parts of the page that Social Fixer knows how to process. Click on a box to hide that area from future renderings of the page. Hidden areas are highlighted in red so you see what you’re missing and show any of them again when you wish. You can remove the left and/or right columns of Facebook’s standard three-column format. The option to stretch the center column to fill the new space is gone because it was hard to maintain and often caused undesired side effects. But you can add wide-format stylesheets from UserStyles.org to make use of the extra space. There are dozens of tweaks to Facebook that you can make with Social Fixer. It returns control of the user experience to the user, as long as a desktop browser is used. Mobile versions of Social Fixer are the Next Big Thing, and I hope that happens soon. To install Social Fixer, visit the download page and click the link for your web browser. 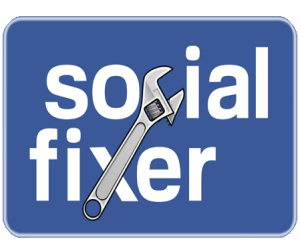 Social Fixer is available for Google Chrome, Firefox, and Safari. Support for Microsoft Edge (the new browser in Windows 10) is listed as "coming soon." If you use Internet Explorer or Opera, no Social Fixer for you. It's important to realize that Social Fixer is the creation of one guy, Matt Kruse. By day, he writes web applications for a staffing company. After his wife and kids go to bed, Matt stays up until the wee hours of the morning refining and expanding Social Fixer. It’s a work of love, he says, and that’s why he does not insist on being paid for it. But there’s a donation button, and if you find that this handy tool makes your time on Facebook measurably bettter, click it to express your gratitude with a few bucks. Most recent comments on "[FIXED!] Social Fixer is Back and Better"
Not sure what's confusing. Everything seems to be clearly explained. He also provided a post of what's available and an additional FAQ was provided. There's an option you can "turn off the fixer" if you choose to do so. People use desktop computers for FB??? Just another proof that God is Multitudinous, but Subtle--- VERY subtle. I'D LOVED that little program, donated several times because I tend to think we ALL need to help and support each other with good ideas they develop and we use (just like it would be the other way around). I'd written it off as a good idea with a cigar, but FB wouldn't let him use matches or a lighter. One of my first stops today. Thanks for keeping an eye out for this Bob!!!! -- one of the FEW tools I used every second I was-am on Facebook. It's kinda like reading and typing, DON'T LEAVE HOME WITHOUT IT!!! -- though I DID hate the double return when it broke. I feel joy that he kept with it. I thought he'd thrown up his hands in anger and frustration and went on to do other cool things to help people. Who says you only bring gloom-n-doom? Today you may my heart sing! (without ANY reference to the 1960's-early 70's). "Error: 'alert' called on an object that does not implement interface Window." Nice write up. A couple of points your readers might like to know. First of all, apart from Internet Explorer and some of the less used browsers, Social Fixer for Facebook may work with a browser not listed INCLUDING Opera. Browser developers have various requirements including the need to approve extensions/addons before they can be installed. If the extension for your browser hasn't yet been released, you will probably find that there is a user script (available from the download site you linked) which will run in the Greasemonkey (for Firefox) or Tampermonkey (for many other browsers). Secondly if anyone is having trouble with installing (or anything else), the Social Fixer User Support Group on Facebook is there to help you and if they can't, they can get answers from Matt Kruse. It's at https://www.facebook.com/groups/SocialFixerUserSupport. Thanks for a very clear article about this great extension. I was on FB 2 differnet times and got off. Don't like the security. I know I got a trojan both times. But the last straw was when they said my 15 character password, made by a randon password generator, was insecure. I changed it to "JaCk10" (without the quotes),and they said that was great. I set it as my new password; logged out; did something else for 15 minutes; logged back in with the new password; and canceled the account. That was more than 5 years ago. I occasionally wish I had a FB account, but I have more time to do other things and waste less time. I do not like their security methods. I don't really miss it! FB Purity, on the other hand, simply works. All the time. And while it doesn't do all of the things Social Fixer does, it does other things that SF doesn't do. I've thought about trying SF again, but then I realize it's just a question of time before it's broken yet again. Meanwhile, FB Purity is reliable, month in and month out. Never a problem. This is AWESOME news! I sent Matt Kruse a message with a "big phat THANK YOU" for his diligent work. More new stuff! It's like being a kid again, with all the aches and pains of old age. Bring me a beer, Wrench! (Where did Nurse Ratchet go, anyway?) I'm going to have to check this out. Thanx, Bob, and everyone else who contributed here to my new database! Tried to download. Got message that the new version for Firefox users hasn't yet met Mozilla's approval or something like that. Will you alert us when ready? The feature which makes Enter create a line break is not yet implemented in SFx 15. We're told that it's on Matt's TODO list. It works in Opera and other Chrome-derived browsers (e.g. Chromium; Vivaldi) by one of two paths: either install that browser's version of greasemonkey; or use that browser's built-in or addon-supplied ability to install extensions directly from Google's Chrome Store. Matt is also working on an official Opera extension (it -- and the Firefox extension -- are wending their ways through the respective "store" approval processes). He is not yet working on official Safari packaging due to not having a Mac on which to do the work. Lucky me I don't use Facebook. So glad this is working again, albeit not totally, since many of the very useful features still have yet to be implemented. That, and need Greasemonkey to use this for now, until Firefox signs it. I'm sure we'll get them in the next release or soon after, which hopefully won't take another 1 3/4 years to happen! One of which is that I really hope we'll get back will be being able to disable the annoying lightbox photo viewer once more, which I hate so much, and is God-awful! In the meantime, F.B. Purity is a good alternative, especially since they have the FRIEND TRACKER, which S.F. sadly gave up a while back, but also hopes to let us reinstate it eventually as well. P.S. Is this a precursor to the apocalypse? A mistake on askBob! EDITOR'S NOTE: You can cancel the apocalypse. Social Fixer *is* available on Firefox now. As explained on the download page, you have to first install the GreaseMonkey extension. Some of it is OK but it is already p---ing me off big time. It is no different to Facebook, deciding what I do and don't want to read with pre-loaded filters. I AM interested in any politics, either U.S. or U.K and Fixer has come with those filters enabled. I have tried everything, short of disbling Fixer to display anything political from U.S.
Grant -- SFx doesn't ship with any filters turned on. One thing that seems to cause all sorts of trouble is if you have two versions of it installed at once. Depending on which browser and extension-installing system you're using, the old version 12 and new 15 look like different extensions (therefore the new doesn't forcibly uninstall the old). Then they conflict in bizarre ways. There's an FB group "Social Fixer User Support"; one of their frequent answers is a step by step "how to remove all traces of extra SFx versions" paper. Go find it. ... And if that's not it, post for help there, with more details like browser name & version, install method, maybe screen shot of the filter option page showing which filters came up pre-enabled. The script version of Social FIixer can be used on any browser that supports the Greasemonkey or Tampermonkey extensions. That includes Opera. Yes Joe M some of us do use a desktop for face book because we don't want to be tied down to it . you obviously have nothing better to do all day if you have to have it on your phone.